We are members of the Motor Industry Code of Practice. Friendly, professional and helpful service. Universal Garage (Whitby) Ltd has been trading since 1935 and has been synonymous with Renault for 43 years when the Renault franchise was first formed. 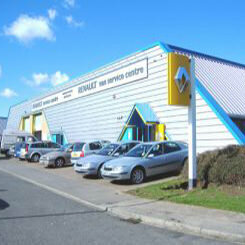 Seven years ago the company moved their repair centre to Enterprise Way. Technology and customer expectations having changed, making this necessary. Managing Director Ivor Greer says that the difference in working conditions and customer service given has now put us in the top of Renault's service outlets in the country. National customer satisfaction shows an average of 79% - we return 97%. All employees are longstanding with the newest member being employed for 18 years and longest celebrating 35 years of employment. Several facilities that directly benefit the customer include customer washrooms, a disabled toilet and a comfortable reception waiting area with Wi-Fi, newspapers and refreshments. The company offers a free collection and delivery service. Our aim is to keep customers safe and mobile wherever possible and a courtesy car is available at times of need if required. Managing Director Ivor Greer explained that customers also come from out of the area including Scarborough, Middlesbrough and even Glasgow because of the service that the garage has to offer. A more friendly and personal attitude is favourable which is not available with larger companies. We are always looking to improve our services. Please feel free to contact us and tell us what we did right and any suggestions on how we could do things better. "Just a short note to thank you again for helping us with repairs to our car over the last couple of days. We really appreciate how difficult it was to fit such a large job into your very busy schedule. Your friendly, professional and helpful attitude made the whole process much less painful than it might have been. We would also like to express our sincere thanks to Ivor for the extra hours he put in and his professionalism in carrying out the repairs. His 'can do' attitude is one that is not often found these days!" "I would like to take this opportunity to thank you and your team for the manner in which both my husband and i have been treated whilst visiting your showroom. We are both over the moon with our recent purchase and we look forward to offering you our future business. Thank you once again for your help and assistance." "I am just writing to give my feedback on your service. I found the service by your staff to be perfect and very efficient and fast, thank you! I would not hesitate to use yourselves again if i happened to be back in the area. Thank you."